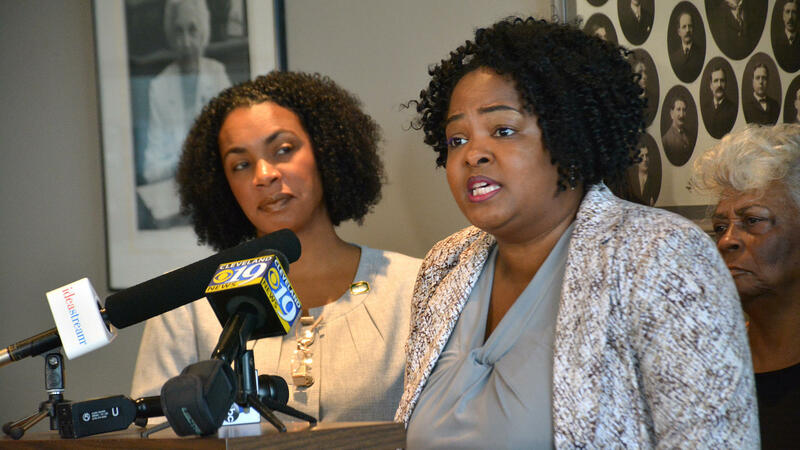 The leader of the Ohio Legislative Black Caucus joined with some Cleveland City Council members and other local officials to support Issue 1 at a news conference Thursday morning. The proposed constitutional amendment would reduce penalties for drug possession, reclassifying lower-level felonies as misdemeanors. It would also allow incarcerated people, with some exceptions, to shorten their prison sentences by taking part in job and education programs. State Rep. Stephanie Howse, D-Cleveland, along with Democratic Cleveland City Council members Blaine Griffin and Jasmin Santana, spoke in favor of the ballot measure from council’s committee room at city hall. Oakwood Village council members Eloise Harden and Candace Williams also endorsed the issue. Howse, who chairs the state legislative black caucus, said incarceration disproportionately hits low-income and minority communities. A felony record, she said, has lasting consequences. “When people get this lifelong sentence of being known as a felon, they are unable to have just the basic necessities of life,” Howse said. Issue 1 has the support of the ACLU of Ohio, NAACP chapters and Democratic gubernatorial candidate Richard Cordray. Among the opponents are Republican candidate for governor Mike DeWine, the Buckeye State Sheriffs’ Association and the Ohio Prosecuting Attorneys Association. Local drug court judges have said the amendment would remove an incentive—the threat of felony charges—that keeps many defendants in treatment. Griffin said the legal system could focus more on solving violent crimes, rather than prosecuting drug users who need health treatment. Polls by Baldwin Wallace University and Suffolk University/Cincinnati Enquirer found Issue 1 leading among Ohio voters. In both polls, support was below 50 percent, and about 20 percent of voters were undecided.